Red Shirts Protest in Bangkok- This is the Military Attire? Bamboo and tire blockades, fighting with slingshots, how much weirder can things get? 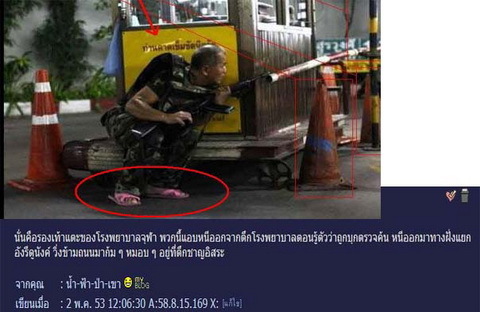 Guns and pink flip flops- or, seeing this is Bangkok – real guns and pink flip flops.Worn by the military? In battle with the Red Shirts? This entry was posted in Bangkok, Thailand and tagged Flip Flops, Red Shirts in Bangkok, Red Shirts Protest, Travel to Thailand May 2010. Bookmark the permalink.